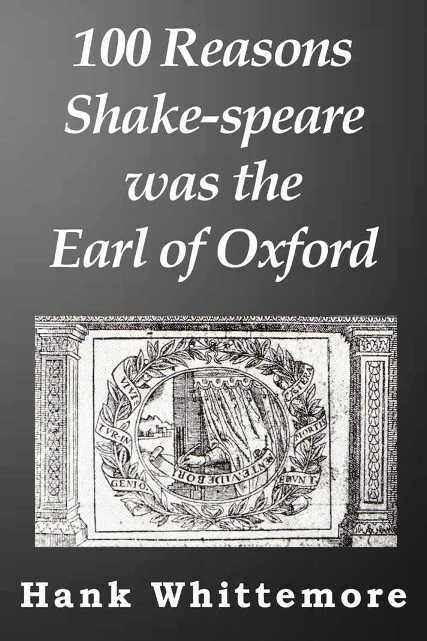 100 Reasons Shake-speare was the Earl of Oxford has finally arrived at Amazon on Kindle. This move has required a reduction in the number of illustrations, which, however, have become sharper. In addition, the book is now linked to distributors and can be ordered by stores and libraries. In regard to the latter, it is to be hoped that many more Oxfordian books will find their way into public libraries and, importantly, into the the libraries of our schools, colleges and universities. The local library must become a welcome home for books about Edward de Vere. No minds can be expanded or changed without information. We are still faced with the fact that, after nearly a full century since J. Thomas Looney published “Shakespeare” Identified (1920), most folks have yet to hear about the authorship question itself (or a balanced version of it), much less about the evidence for Oxford as the greatest writer of the English language. The introduction of E-books at libraries of high schools, colleges and universities is allowing this information to spread among new generations, whose members will challenge the longstanding “Stratfordian” paradigm of Shakespearean biography. This challenge, in turn, will clear the stage so the Earl of Oxford can emerge from the wings to make his rightful entrance before the world audience — an audience that, for so many generations, has been moved to the heights of laughter as well as the depths of tears by the mirror he held up for us.